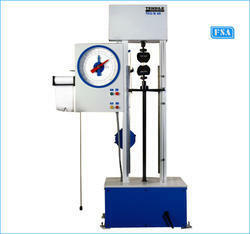 Driven by perfection, we are instrumental in manufacturing, supplying and exportingIndustrial Tensile Testing Machines. Extensively used for conducting tensile strength tests, these machines are manufactured in tandem with industry set standards and so for the reason highly appreciated by the customers. Along with this, our experts rigorously examine these machines on different parameters of quality and performance, before the final delivery to the patrons. Leveraging on the vast experience of this domain, we are engaged in manufacturing, supplying and exportingAnalogue Tensile Testing Machine. 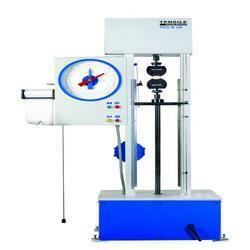 These tensile testing machines are manufactured by using premium quality material and following industry norms, under the guidance of experienced professionals. Stringently tested before the final dispatch, these machines are suitable for testing rubber, Teflon, cardboard, latex, composites, ferrous metals, non-ferrous metals, wood, plywood, plastic, resinsandceramics. Understanding the requirements of the customers, we are engaged in manufacturing, supplying and exporting Analouge Tensile Testing Machines. 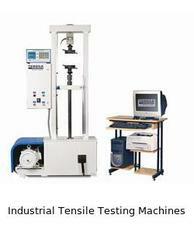 These tensile testing machines are manufactured at our sound infrastructure, in accordance with international standards. Also, our experts supervise these machines at every stage of production, in order to maintain higher standards of quality and remove flaws, if any. We also offer these machines in custom-built range, as per the needs of the patrons. Elongation scale with least count 1 mm. 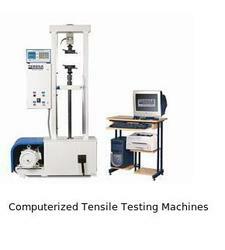 With firm commitment to quality, we are engaged in manufacturing, supplying and exportingComputerized Tensile Testing Machines. Our professionals strictly follow industry laid guidelines and utilize optimum quality material while manufacturing these testing machines. A team of experts supervises every stage of production, in order to maintain higher standards of quality and remove defects, if any.